In 2018 the Belgian company DUMOULIN BRICKS has renewed their two main equipment for molding and shaping clay bricks: The Filter Mixer and the Extruder. They chose Verdés as their technical partner for the supply of the two new equipment. The purpose of the intervention was to incorporate a new equipment capable of surpassing the production rates and working pressures accomplished by the existing machinery already working on the limit of its capacities. 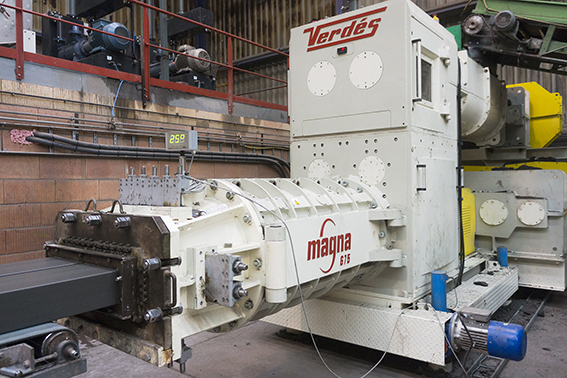 Verdés accepted this challenge relying on its long experience in molding and its new design of MAGNA extruder, released in 2013 and counting with the newest technologies in extrusion. The supply consisted in the filter mixer model A-750-F and the MAGNA 675 extruder. The model A-750-F is the largest machine of its range. It consists of a 1800 mm long trough open mixer which incorporates a compression zone of 875 mm that compact the clay against a grid, thus obtaining a high efficiency in homogenization and catching the impurities of the material in the process. The capacities of this model exceed the actual production requirements to allow the possibility of a future increase in productivity rates. The extruder Magna 675 has a production capacity up to 85 t/h, highly superior to the current production. It counts with an auger diameter in the vacuum chamber of 675mm and 650 mm in the front. This configuration permits applying a range of pressures up to 25 bar that provides flexibility to produce different clay block formats. The higher applied pressure also allows to work drier and reduces the consumption in the drying furnace that follows. After several months in production, the results are clearly visible: the working pressure has increased, giving more stability to the wet blocks and enhancing the productivity of some critical product formats. The machines are currently working far from their maximum capacities, resulting in a reduction in the wearing of the critical parts. The molding process has improved its efficiency and is prepared for a future increase of capacity in production.